(Editor's Note) New readers in San Diego, Southern CA, please bookmark the Left Coast Rebel. Also read Temple of Mut's San Diego coverage as well. Thank you for linking, Instapundit, likewise Gateway Pundit! Just breaking (nearly, literally) a big earthquake came rolling through San Diego, centered in Baja California. It clocked in a 6.9 in Mexico. I'll be back in mere moments for updates. UPDATED x3: Another graphic via USGS, be sure to check in here often, I am searching for Mexican news accounts of this earthquake. Does anyone know the damage toll in Mexico? Any deaths related or property damage? UPDATED x5:I'm reading first hand accounts at USGS that the 6.9 Mexicali quake was felt as far away as Arizona. Reuters - A strong magnitude 6.9 earthquake was reported on Sunday in Baja California, Mexico, the U.S. Geological Survey reported. The quake occurred at 15:40 Pacific time (6:40 p.m. EDT) 16 miles south southwest of Guadalupe Victoria, at a depth of 20 miles. The quake was 108 miles east southeast of Tijuana. The quake was felt in downtown Los Angeles. Five small earthquakes struck Saturday and today in the same area of northern Baja California and were close enough to be felt in San Diego County. The largest hit Saturday just after 4 p.m. and was estimated at magnitude 4.3. Its epicenter was about 30 miles southeast of Calexico and 100 miles east of Tijuana, according to the U.S. Geological Survey. The first weekend quake was magnitude 3.2 at 1:40 p.m. Saturday, and it was followed by a magnitude 3.2 at 12:52 a.m. and a 3.4 shaker at 2:36 a.m. today, according to the USGS. 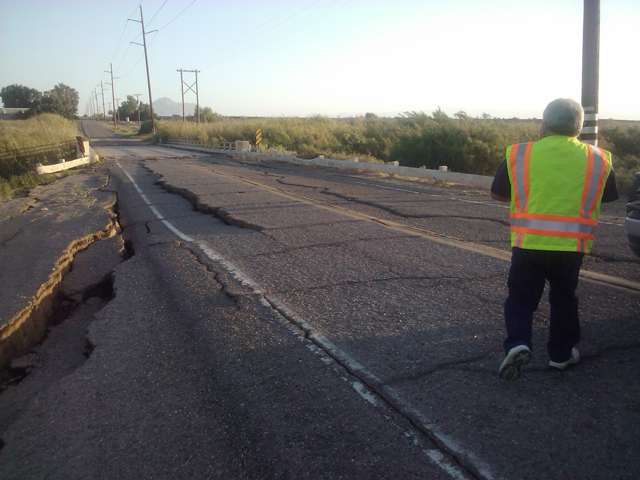 There was no known damage as a result of the quakes, the latest of hundreds of small quakes that have been rattling the Imperial Valley and East County since 2007. The swarm is centered near Guadalupe Victoria, a small farming town 19 miles southeast of Mexicali. The US Geological Survey on the afternoon of Easter Sunday monitored a large earthquake in the southern Imperial Valley south of Mexicali, Mexico near the Colorado River, at about 15:40 PDT (22:40 Z). It was felt throughout the surrounding area for a great distance. 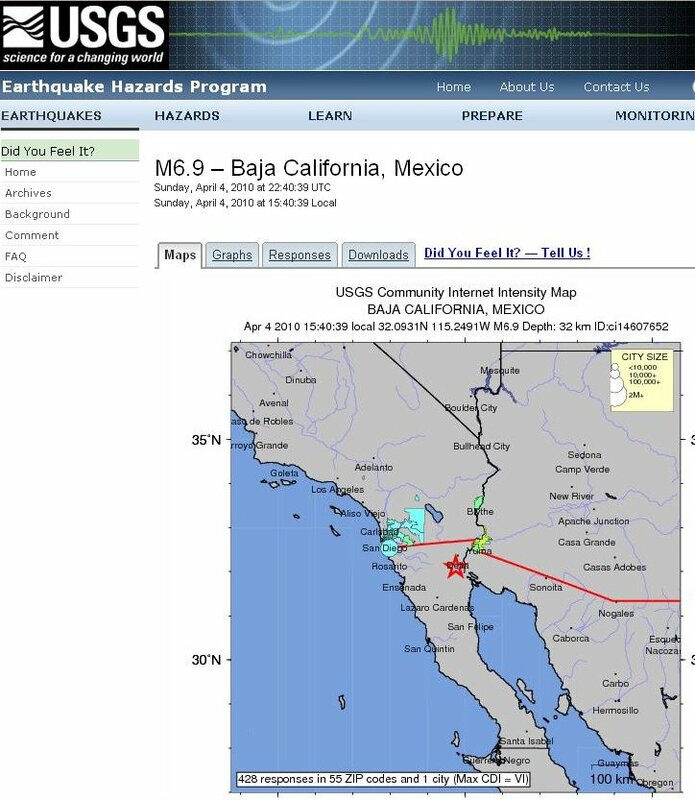 The USGS reports that the epicentre was 26 kilometres (16 miles) south-southwest from Guadalupe Victoria, Baja California, Mexico, and 173 kilometres (108 miles) east-southeast from Tijuana, Baja California, at a depth of 32.3 kilometres (20.1 miles). 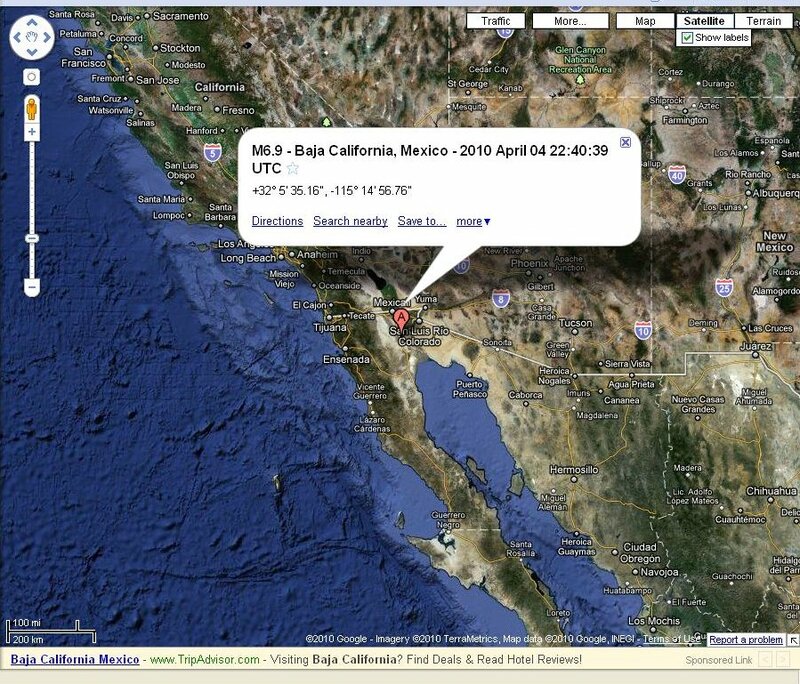 According to witnesses, the quake was felt as far away as Los Angeles, California. I read that Guadalupe Victoria is a small farming town. That is good news, meaning that there will be less property damage, injuries, etc. No injuries or property damage reported in San Diego as of now as well. Also, the distance from Mexicali to Los Angeles is 186 miles. UPDATED x7: The updated shakemap from USGS.gov shows large aftershocks in the Mexico/CA border area. At this point, nothing exceeds the initial 6.9 shaker. 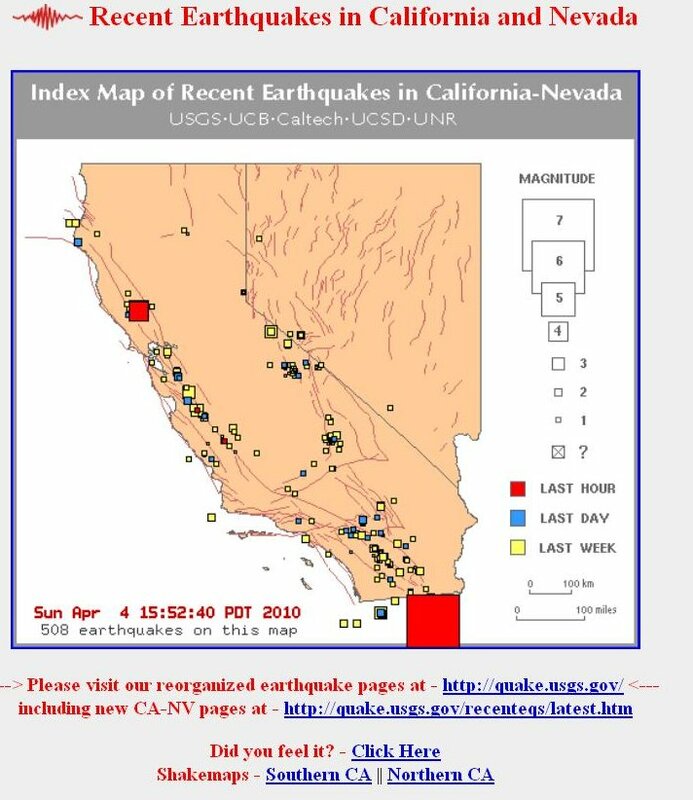 Be sure to click each red box for characteristics at USGS.gov (Editor's Note) - The graphic below is a static image. 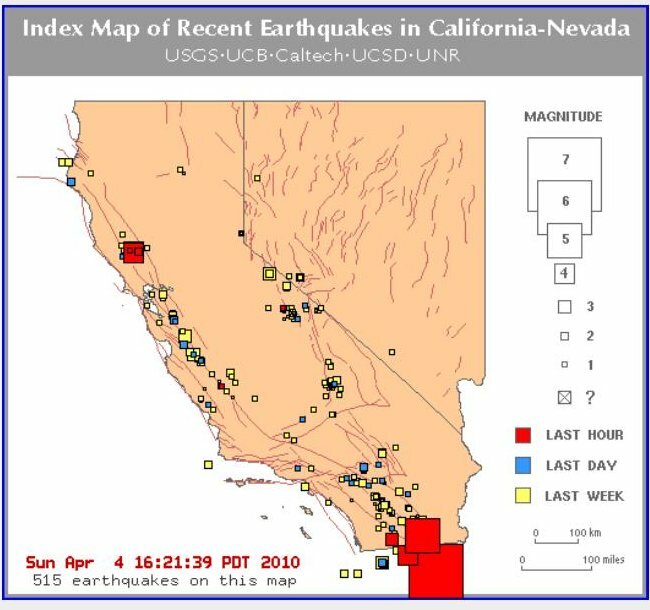 Go to USGS.gov for the interactive map. UPDATED x8: KNX 1070 out of Los Angeles is carrying the Mexico/CA earthquake news live. As of this moment, (4:37 PST), they are talking to a Mexican resident talkig to a reporter from inside a church. 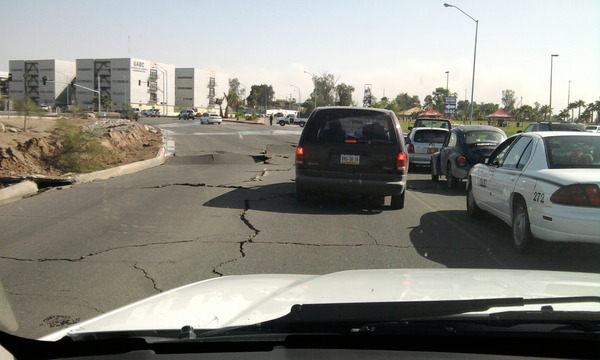 She said that the quake was so strong (Mexicali, I believe) that she and her family could not even stand in the street due to the motion. Also, they could hear breaking glass, etc. Still no definitive injury or property damage reports. She mentioned that people in her area were taken to the local hospital. Also, CBS is carrying live video. 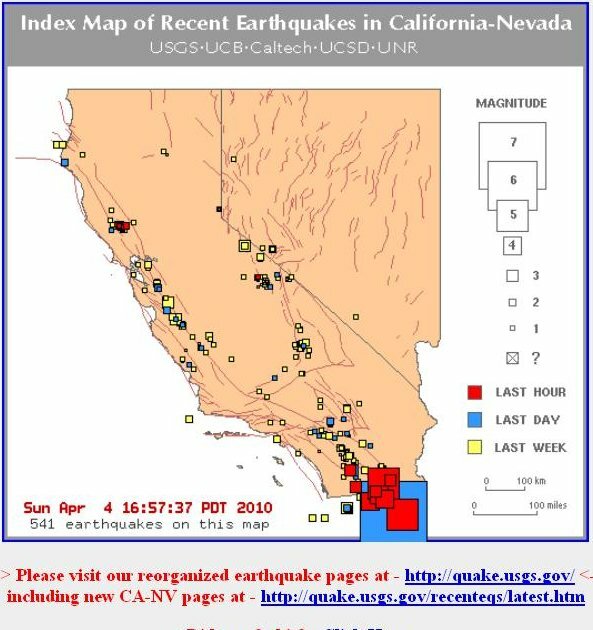 UPDATED x9: I just spoke with a reader in Riverside County, CA and they felt the earthquake seemingly as well as I did. Also, they noted several small cracks in the ceiling in their home that had not been there (hi, Mom!). UPDATED x10: I just read that several highrises in Los Angeles went on city-wide 'earthquake alert' and elevators stopped with people inside. Also, the elevator (or one of them) at the Disneyland hotel was shut down as well. Is it up and running now? This should come as a shock to anyone but the rides at Disneyland have been shut down as well. UPDATED x11: The Disneyland Hotel Elevator situation is a false rumor. No one was trapped in the Disneyland elevator. Also, I heard an account from an L.A. resident that mentioned that her swimming pool sloshed around so violently that much of the water ended up in their backyard and out of the pool. UPDATED x13: Here's one to tuck away for the X Files. A listener called into San Diego's Kogo and mentioned that her family owns turkeys at a local farm. The turkeys started 'gobbling' minutes before the earthquake hit at 3:40 PST. Gobble, Gobble!Also, all joking aside, I am searching and searching for any information on damage/injuries in the Mexicali area. Please comment here if you have any information. 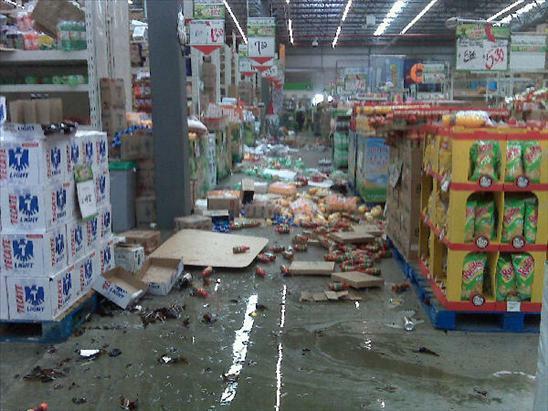 Information about quake damage in Mexico remains sketchy. 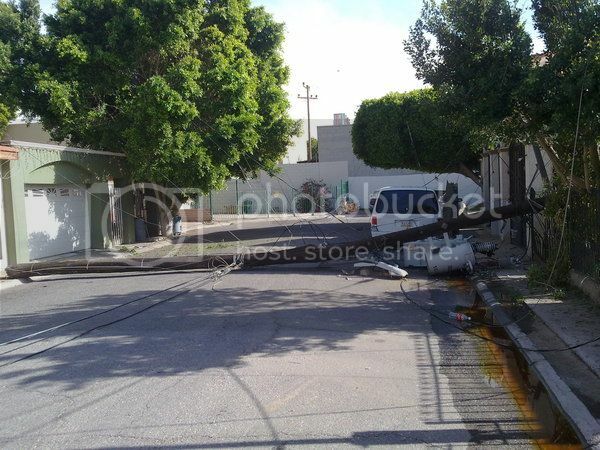 According to Reuters, there have been reports of people trapped in elevators, collapsed retaining walls and power outages in and around Mexicali. 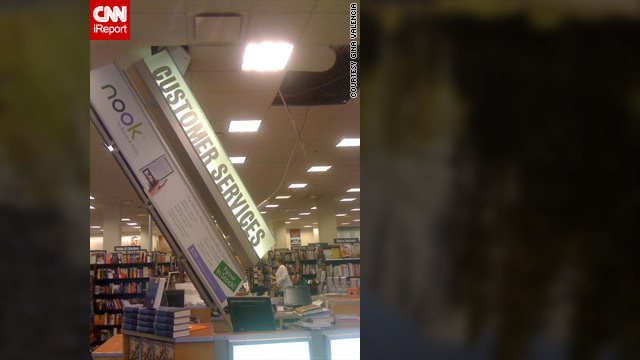 Telephone lines were down and items fell off of shelves and bookcases, according to reports. Palm Desert is outside of Los Angeles. Leave comments here at the Left Coast Rebel if you have first hand accounts of damage or otherwise. People report to San Diego 6 News from throughout the region that items fell off shelves. 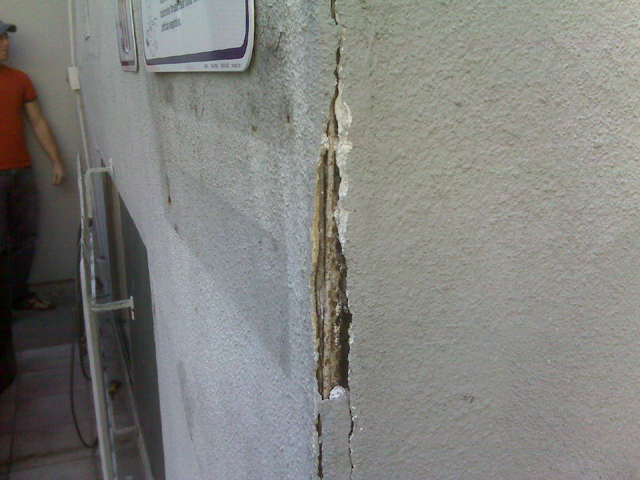 There are some reports of cracked buildings in North Park. 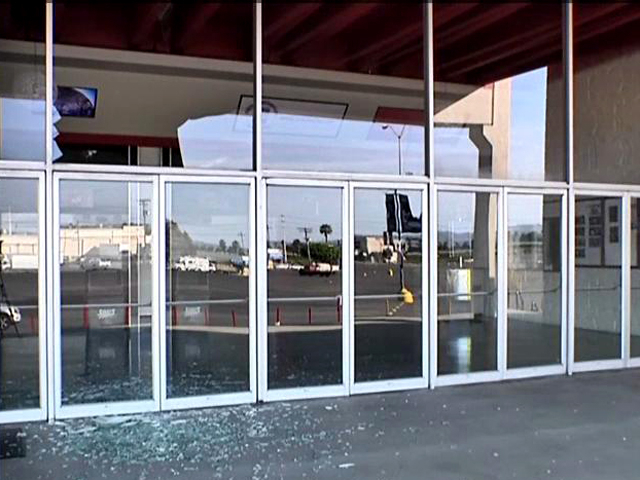 There are also reports of broken windows in Santee and El Cajon. 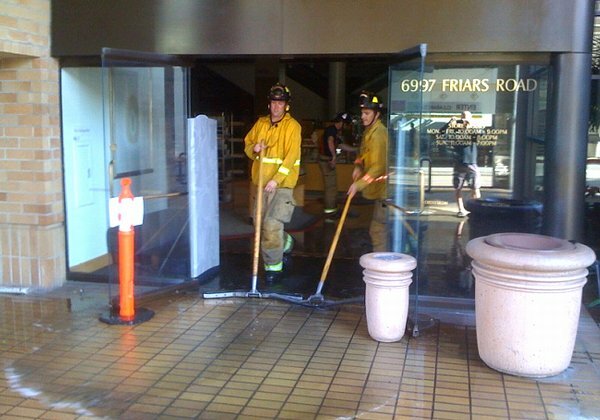 San Diego firefighters were sent to check reported damage at an old building at 4133 Kansas St., and police reported several water main breaks across the city. I hope everyone is safe and unharmed in Mexicali. 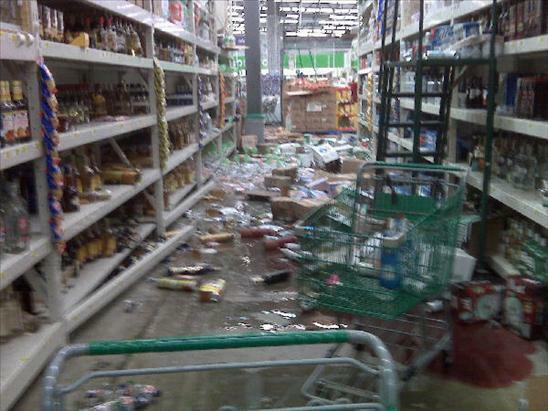 Authorities have confirmed that the quake caused at least two water-main breaks in this region. One was reported near Mission Bay High School and the other was at the Nordstrom store in Fashion Valley, said San Diego Fire-Rescue Department spokesman Maurice Luque. American Power also has shots of people fleeing Disneyland and a CNN video of a family in Hemet California. The video shows their swimming pool having the water literally shaken out of it. Be sure to check it out. UPDATED x20: By the way, can I just say how vastly important alternative media now is? I literally have access to photos and information that the giant legacy media doesn't! 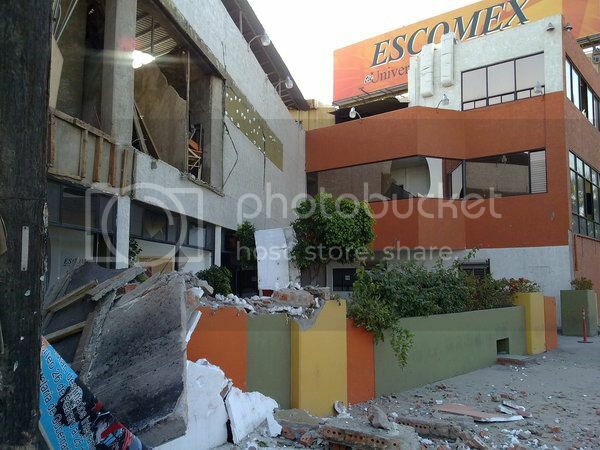 At least one person was killed in a building collapse in Mexicali, according to the assistant director of civil protection in Tijuana. Local San Diego radio mentioned that several people are trapped in a Tijuana elevator. I will see if I can find information on this. 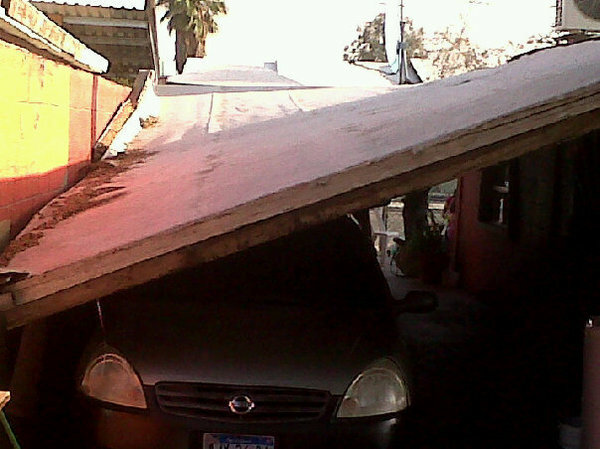 ...just heard from my family in guadalupe victoria, my family is ok, no injuries i hope all the same. thanks for your updated site. good luck to all. I hope that good news like this keeps coming in! 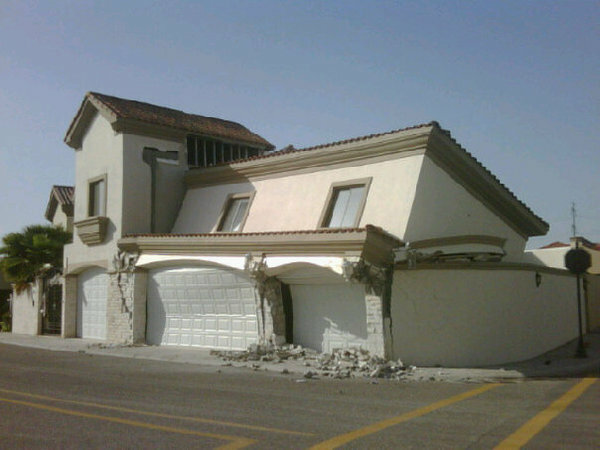 UPDATED x25: A local San Diego resident caught the earthquake via. surveillance camera footage at his residence. Wow! We felt it here in Allied Gardens, waring road off the 8. Everything was swinging and scared the hell out of the cat. Reported on line as 6.9 and 20 miles deep in Mexico. We felt several waves of slow, gentle rolling even out here east of Pasadena. I Wow....... just wow I was in downtown by the Sante Fe Depot and felt it. The biuldings were shaking back and forth and it was prettty cool. Amtrak is being delayed. It did seem to last forever! With the wind blowing like it is, at first I thought it was just a big gust of wind causing the movement. It only took a couple of seconds to realize this was a nice size earthquake! Strong here in Tijuana, you seem to be the first to report this quake, hard to believe how slow the local news media has responded or not responded to this so far. Wow, glad everything is ok. I see that a 4.0 quake just hit Northern Cali a few minutes ago too. We felt it hear near Los Angeles as well. Like a wave for 30 seconds. This one and the last one I was at work, an oil refinery, and I do not like it. Can it just wait until I am off work to hit? I wonder how the global warming alarmists will use this or how President Obama will blame former President Bush? No doubt the biggest quake in my memory. I am in North County as well and was shocked at the duration and more so when I realized that it had happened 4 minutes prior in Baja. 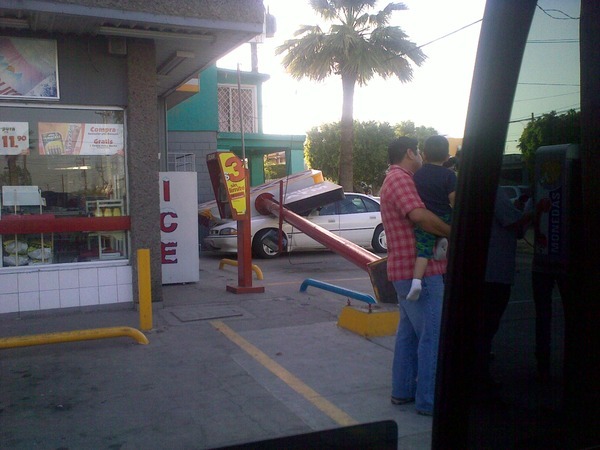 I hope the damage isn't too bad. Crazy. Nothing here in North Central Phoenix. I lost my balance and ran out the door. 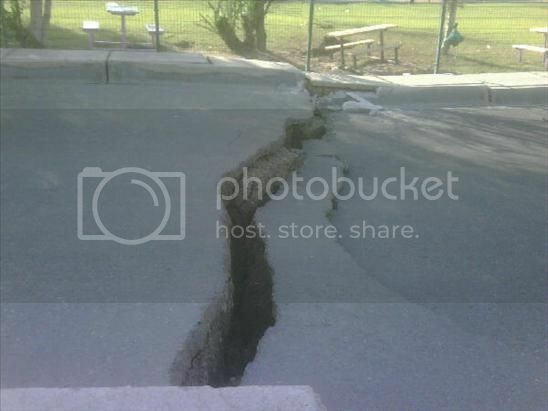 I felt the earthquake today in Santa Clarita (edge of LA county north). I am here is Belgium, Waffles. I felt it too. I believe it was a flap jack 49er for us. Hey Todd, That's some pretty paranoid bit dot connecting you're doing. Why don't you give it a rest? If you spent more time working or thinking productivly you might not be blue collar todd anymore. that's the American dream isn't it? I felt it in Santee CA. The glass in my bathroom shower caused me some alarm. Thought it was something to do with the strong winds we had....but it lasted for a bit of time. I hope that this is not a damaging earthquake. i thought we were on board for something damaging. There were several aftershocks ranging from a 3.6 in Anza-Borrego to a 5.1 in El Centro. Felt it in west Phoenix, around 83rd Ave. and Indian School. Kept going on. Some of us got motion sickness. We might've felt it though 'cause we were outside sitting on chairs on bare concrete. Felt it here in Washington. Felt it here in LA, same sort of experience, like seasick for a minute or so. No damage that I know of (pretty mild by the time it got here), but still easily felt. 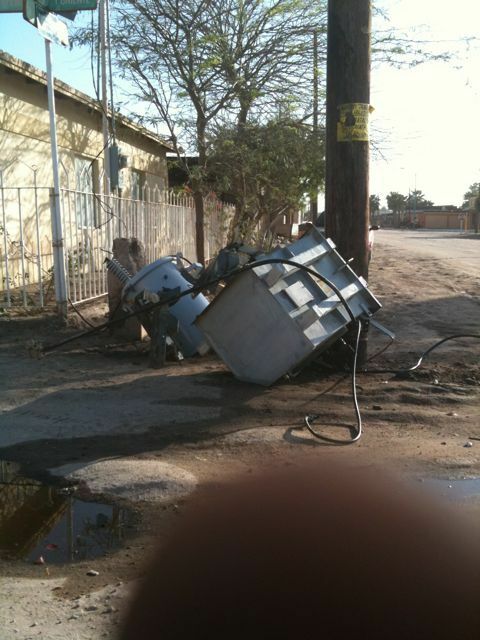 American Power tracked-back with, 'Magnitude 6.9 Earthquake Hits Mexicali! - UPDATED!! - Crowds Flee Disneyland!! - PICS! VIDEO!!'. Felt it in Scottsdale, Arizona as well. Was on my bed reading a book and then said "hey, is my bed moving." Then, "yeah, my bed's moving". And it kept moving! Then I figured it was an earthquake. It was a long one. any one have any info on injuries in guadalupe victoria? i have family their and havent heard from any of them! Huntington Beach. My first earthquake. I got dizzy and nauseous. Then I felt like I was on water--everything sloshing back and forth for about 20 seconds. No damage that I am aware of. Felt it long and strong here in North Orange County. We lost a foot of water out of our pool. LCR- Hope everyone is OK on the Left Coast. Fortunately those of us on the right coast don't have to experience this. just heard from my family in guadalupe victoria, my family is ok, no injuries i hope all the same. thanks for your updated site. good luck to all. Another HB-er here....definitely loooong and swaying. No noise, no big jolt, but it was unsettling how long it went on. Felt one of the aftershocks, too. The inlaws in Palm Desert had pictures shaking quite a bit on the walls, but nothing actually fell. We felt it here in Peoria AZ, off of 101 and Thunderbird. Our furniture was shaking it did last for a few seconds. You're right. We felt it in Del Mar and it went on and on. We were joined outside by our neighbors to enjoy the vibe. LCR, I am just getting to my computer for the first time in hours and I realize things are a shaking in your hood! Glad to hear you are OK. Excellent coverage you got here. Great work, LCR. I saw the link to you at Pajamas Media. Wowee! Thanks for your great coverage of the quake!